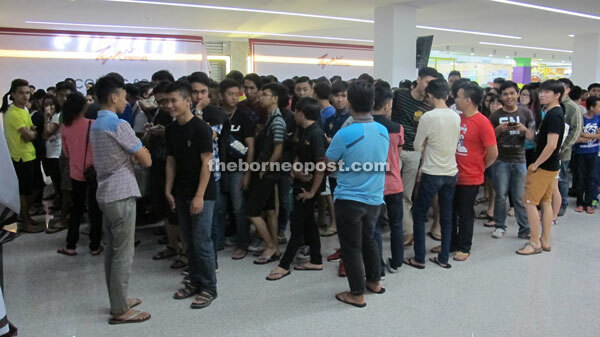 The crowd queuing up for free tickets to the TGV introductory movie screening at PICM yesterday. MIRI: TGV Cinemas, one of Malaysia’s leading exhibitor and multiplex cinema operators, will be welcoming movie lovers here to their first TGV cinema in East Malaysia today. Located strategically at the city’s new landmark, Permaisuri Imperial City Mall (PICM), the cinema has a total of eight cinema halls with a total seating capacity of 1,263. All halls are fitted with the state of the art Dolby Digital sound system and Christie CP2220 digital cinema projector system for TGV Cinemas at PICM to play not just standard 3D but also high-frame-rate 3D (HFR) movies. And the first row of each hall has been fitted with iconic Beanie seats (bean bags) for a more comfortable and relaxing viewing experience in the front row. Chief executive officer of TGV Cinemas, Gerald V Dibbayawan said the opening of TGV Cinemas in PICM is significant to the company’s growth as it is their first cinema in East Malaysia. PICM is located in the centre of Miri’s central business district for the convenience of shoppers from Brunei, Bintulu, Limbang and Lawas. It has attracted a number of premium brands to be worthy of being called a premium shopping mall. “PICM’s prime location makes this mall a suitable location for our first foray into East Malaysia, and paves the way for two more cinemas we have lined up in Kuching and Kota Kinabalu, respectively,” said Dibbayawan yesterday. As part of the opening festivities, TGV Cinemas organised an open house in TGV Cinemas PICM which included the distribution of 1,000 popcorn sets and free screenings of blockbuster movies for the public at 5pm yesterday. The free movies were Maleficent, Transformers: Age of Extinction, Marvel’s Guardians of the Galaxy and Interstellar. “This is part of our efforts to celebrate our latest cinema and introduce the unique and enhanced cinema experience synonymous with TGV Cinemas to movie goers, especially in Miri,” he said. In addition to the new cinema in PICM, TGV Cinemas is also opening four other cinemas around the country, namely in AEON malls in Bukit Mertajam (Penang), Kulaijaya (Johor), Seri Manjung (Perak) and Jaya Shopping Centre (Selangor). Dibbayawan said this is an exciting time for TGV Cinemas as it is the first time the company simultaneously spreads its wings to all corners of the country. With the opening of all five new cinemas, TGV Cinemas will have 27 multiplex cinemas with a total of 219 screens and total capacity seating that exceeds 37,500. TGV Cinemas will also be organising 30 Days of Goodies in all new locations, whereby for each day, customers can claim a free goodie from TGV Cinemas in the form of movie passes, popcorn, drink vouchers and movie premiums. “We also look forward to introduce innovative concession offerings like our Popcorn Royale which is our signature popcorn and distinct popcorn flavours such as corny cheese, roasted chicken, kimchi and curry,” he elaborated. The Hobbit: The Battle of the Five Armies will debut as the first movie for which tickets are available. The movie is available in 3D and HFR 3D. For details about TGV Cinemas, their new cinemas and the opening activities, visit www.tgv.com.my or follow them on Facebook, Twitter or Instagram.